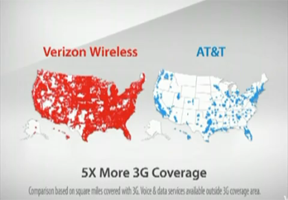 In early October Verizon started running a commercial series comparing their 3G wireless coverage to AT&T’s 3G coverage. The commercials got AT&T’s attention, and they requested Verizon modify the campaign. AT&T says that the 3G coverage maps featured in the campaign, as well as the depicted frustration of iPhone users lead viewers to believe that AT&T users can’t use their wireless devices at all across the majority of the country. I am an iPhone user myself and I can testify to my level of frustration when I can’t drive down Interstate 80 between Lincoln and Omaha NE without my call dropping. That’s not even 3G – That’s a straight cell call. AT&T finally got coverage across Lincoln, NE – a population of over 230,000 people – this summer. Verizon’s advertisements also depict AT&T customers as frustrated or sad and unable to meet their friends as the map showing swaths of white or blank space hovers over the fictional AT&T customer’s head, reinforcing the misleading message conveyed by the maps; that AT&T has no coverage and thus AT&T customers cannot use their wireless devices in large portions of the United States. [AT&T is] losing incalculable market share, invaluable goodwill that it has spent billions of dollars to develop among consumers, and the significant investment it has made in its wireless network. I think this comes down to a pretty basic question. Is Verizon challenging the 3G coverage AT&T offers or AT&T’s overall coverage of any kind. Hello AT&T check out the GIANT “3G COVERAGE” label under the maps. I think it is pretty clear that they are claiming that Verizon has a superior 3G coverage network. How AT&T thinks the commercials make people fell is irrelevant. I decided I would solve this case for whatever unfortunate judge has to hear it before it even goes to court. I hopped in my car and departed from Omaha, NE where Verizon’s map shows AT&T has 3G coverage and drove toward Des Moines, IA. According to Verizon, I should lose my 3G coverage when I leave Omaha and should not regain it until I am in DesMoins. Click here for my route. Testing Verizon’s AT&T map. 3g signal lost at IA mile marker 11 on I80 in Iowa. So far Verizon’s map is accurate. The bottom line is that in the test I conducted, Verizon’s map is accurate and their advertisement is very true. If anything, they were generous to AT&T because there were many times when I had to type and hold a Twitter update because I could not get ANY cellular or data coverage at all on the AT&T network. All of my technicians in the shop are flashing their Droid phones and while I love my iPhone, the plan is super expensive and lets be honest – the 3G coverage just isn’t the best around. I used to use a book called “Evidence that Demands a Verdict.” I think your evidence also demands a verdict, that Verizon is correct in what they say. The reality check, although certainly limited, seems to back up their claims. I’ve heard a lot of AT&T customers complain about their coverage. I use Verizon and have yet to experience any problems anywhere. And the new Droid from Verizon looks seriously awesome. @John That’s why I have not bought the iPhone 3Gs. They are trying to force a 2-year renewal on me. I asked how much if I just buy the phone – no subsidy for the contract. It can’t be done. You can only get an iPhone with a new AT&T line or a 2-year renewal. I am waiting until Apple gets this AT&T exclusivity worm out of its core and opens up the phone to other companies. If they don’t, the iPhone will go the route the Mac did in the 1990’s – buried under a horde of competing devices (Droid) offered through superior channels (Dell, etc..) to the point of market saturation. I’d be surprised if AT&T wins this legal battle. Verizon is simply presenting facts. There is the part where the AT&T customer shakes his head about the poor coverage, but that is a far cry from being grounds to sue. Then again, the legal system often produces surprising results. Att and Apple are trying to misdirect people since there being sued all across the country. Att shows it Cell Coverage map and not the 3G, 2 different things, but thats ATT’s style. Apple is also being sued by Nokia for stealing its technology. I heard that Nokia sues Apple, claims iPhone is stealing its innovations. Batanews has written that this is the world’s largest mobile phone maker calling out one of the most beloved devices of recent history on ten counts of patent infringement. Wow, you did a great job of doing your own homework and out on the field testing. It’s very interesting to see that your test was a proof that AT&T coverage is really not all that is cracked up to be. What’s going to happen in the future with the court and the contracts will be very interesting to see. I used to use a book called “Evidence that Demands a Verdict.” I think your evidence also demands a verdict, that Verizon is correct in what they say. This exclusivity thing is definitely not doing iPhone any favours, and you’re not the only person griping. Just google this subject and be prepared to be overwhelmed! AT&T will have to work hard at getting up to speed, otherwise they’re going to lose out on their exclusive deal with Apple. Perhaps my AT&T experience in the Chicago suburbs is unique but I have zero problems. No voicemail issues, no dropped calls, no odd areas that lack service, no 3G problems. I’ve had AT&T for 9 years (first as AT&T Wireless, then Cingular, then back to AT&T) and having the iPhone on it has only made things better as it’s the most capable phone I’ve ever owned. Many companies blaming each other to steal the concept, many companies even hire cases opposite each others. Verizon’s map seems quite accurate and perfect. @letter writing I am sure that AT&T has strong areas of coverage and signal. I know I am in a more rural area that Chicago or New York, but if they are saying they have coverage, they should actually have it. I’d be surprised if AT&T wins this legal battle. I’m not sure what to make of half of your claims about AT&T’s coverage however I would love to have Verizon just to travel to those supposed area’s where the offer 3g coverage and see if I actually did have any. Oh, wait…like where my father lives and where he had to leave that cell provider because he couldn’t even get voice service because the signal was so weak from them. Companies twist and distort to attract customers, they all do it. However Verizon is outright lying about their 3g coverage map and while it might be fun to jump on the bandwagon it is none the less an outright lie. Not saying AT&T, T-Mobile or Sprint don’t but at least they don’t make erronous claims that they have nearly the entire US covered with 3G services. Don’t believe me? That is fine as I’m not really writing this to change any of your minds, just hopefully you’ll actually go out and try to see the truth for yourselves. For all purposes it doesn’t matter who I use since this is an AT&T / Verizon thing. At&t has a lawsuit for this commerical. its misleading. I get 3g﻿ everywhere i go on my At&t iphone. I’ve heard a lot of AT&T customers complain about their coverage. I use Verizon and have yet to experience any problems anywhere. I love my iPhone, but HATE AT&T reception for phone service, which I think is a different issue than the 3G service. Would Verizon have the same 3G issues as AT&T, if Verizon got the iPhone? i personlly dont have a problem with at&t reception or service and i feel that the iphone is the best thing since sliced bread.